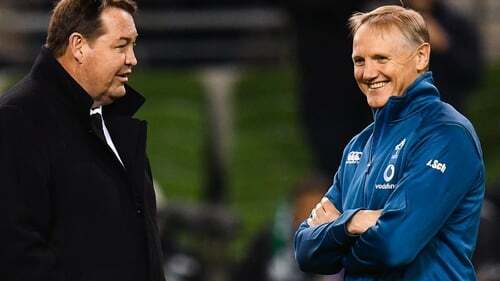 Joe Schmidt would be better off prolonging his Ireland tenure because current All Blacks boss Steve Hansen is likely to stay on after next year's World Cup, according to a prominent New Zealand-based sports writer. The Ireland head coach will tell the IRFU before the end of this month if he wants to extend his deal beyond the end of the Japan tournament next November. The 53-year-old New Zealander has been linked with a return to his homeland and a coaching role with the national team. Likewise, Hansen, who has been in charge of the All Blacks since 2012, is due to make an announcement on his future before the end of the year. Scottish-born Gregor Paul, of the New Zealand Herald, reckons he has the inside track. "Steve Hansen has probably already made his mind up, he just hasn't announced it yet," he told John Kenny on RTÉ 2fm's Game On. "Gut feel? I think he'll probably stay on. "He's argued in the past that he wants to break the cycle of All Blacks coaches being appointed around World Cup cycles. He wants to try and reduce the importance of the World Cup as a contracting tool. "You don't get continuity that way because if the All Blacks don't win the World Cup that coach gets fired. "He wants to break that pattern. "He thinks they should be appointed and stand down in the middle of World Cup cycles. "He's argued that point so I think he kind of beholding to that for another two years after the World Cup and then stand aside. "My gut feel would be that he and Joe are reasonably close... and I would have thought that he probably confided in Joe already what his intentions are. "If I'm right, and I wouldn't want to get anyone in Ireland overly excited, but my feeling is that Joe has decided it would be in his [Joe's] best interests to stay on with Ireland for another two years." New Zealand take on Italy this Saturday, looking to avoid a second defeat from two games after Saturday's 16-9 loss to Ireland. "I haven't seen a team play as well as Ireland probably the whole time I've been covering the All Blacks," added Paul. "Every man probably played their best game all year."